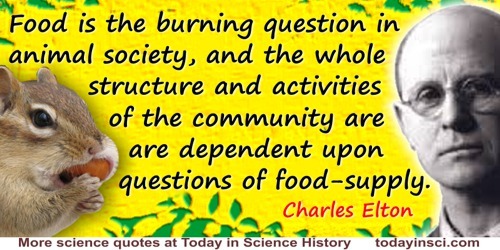 Food is the burning question in animal society, and the whole structure and activities of the community are dependent upon questions of food-supply. If you're overfishing at the top of the food chain, and acidifying the ocean at the bottom, you're creating a squeeze that could conceivably collapse the whole system. Nature being capricious and taking pleasure in creating and producing a continuous sucession of lives and forms because she knows that they serve to increase her terrestrial substance, is more ready and swift in her creating than time is in destroying, and therefore she has ordained that many animals shall serve as food one for the other; and as this does not satisfy her desire she sends forth frequently certain noisome and pestilential vapours and continual plagues upon the vast accumulations and herds of animals and especially upon human beings who increase very rapidly because other animals do not feed upon them. 'Philosophy', in The Notebooks of Leonardo da Vinci, trans. E. MacCurdy (1938), Vol. 1 80. The number of humble-bees in any district depends in a great degree on the number of field-mice, which destroy their combs and nests; and Mr. H. Newman, who has long attended to the habits of humble-bees, ... says “Near villages and small towns I have found the nests of humble-bees more numerous than elsewhere, which I attribute to the number of cats that destroy the mice.” Hence it is quite credible that the presence of a feline animal in large numbers in a district might determine, through the intervention first of mice and then of bees, the frequency of certain flowers in that district! From On the Origin of Species by Means of Natural Selection; or, The Preservation of Favoured Races in the Struggle for Life (1861), 72. We are fishing out the top of the food chain, and it’s pretty crucial because about 200 million people depend on fish and fishing for their livelihood, and about a billion people, mostly in poorer countries, depend on fish for their protein. So this is a big problem. Good news is, it’s fixable. From transcript of PBS TV interview by Tavis Smiley (28 Mar 2011). A new difficulty came into Alice's head. “Supposing it couldn't find any?” she suggested. “But that must happen very often,” Alice remarked thoughtfully. “It always happens,” said the Gnat. In Through the Looking Glass: And what Alice Found There (1893), 66-67.